I have found a creamy dressing that I actually like! 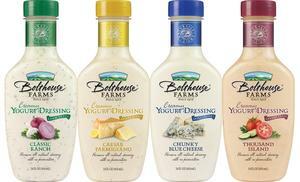 Bolthouse Farms sent me 3 coupons for free bottles of dressing. I chose the ranch, blue cheese, and caesar. My favorite is the chunky blue cheese. It is only 50 calories!!!!! That is so cool. It is very runny and light (in a good way). I had never tried these before and really like them a lot. Thanks for the great product coupons!